WELLINGTON, New Zealand — Ramiro Herrera has been named in the Argentina team to play New Zealand in Saturday's Rugby Championship test in Buenos Aires, one year after making his previous appearance against the same side. 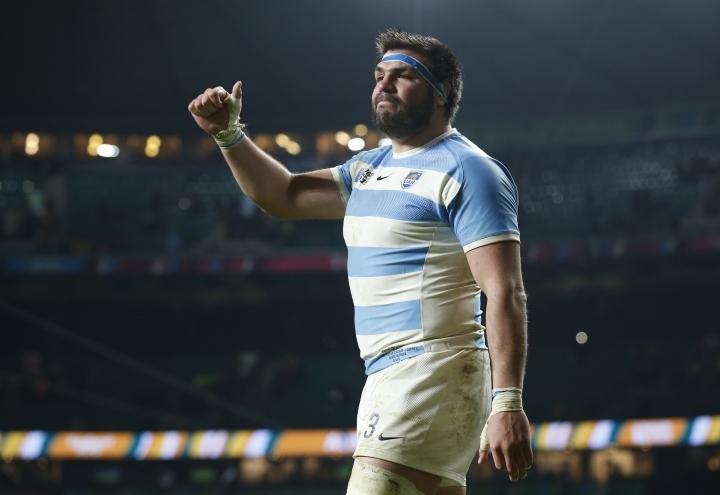 Tighthead prop Herrera played against the All Blacks in Buenos Aires on Sept. 30 last year. His return in place of Santiago Medrano, who drops to the bench, is one of two changes to the starting lineup that beat Australia 23-19 on the Gold Coast two weeks ago. There is also one alteration, forced by injury, in the backline where Bautista Ezcurra will feature at inside center in a new midfield partnership with Jeronimo de la Fuente. Matias Moroni will be on the left wing in place of Ramiro Moyano, who is sidelined by a rib injury. There are two changes on the bench where Matias Orlando and Sebastian Cancelliere return after playing their most recent test against Scotland in June. Meanwhile, Beauden Barrett has retained his place at flyhalf in a reshaped All Blacks team. Barrett carried a heavy share of the blame for New Zealand's 36-34 loss to South Africa in Wellington in the last round of the Championship after struggling with his goal-kicking and match management. His place may have been saved when potential replacement, fullback-turned-flyhalf Damian McKenzie, was forced to return to New Zealand because of a family bereavement. In McKenzie's place, the inexperienced Richie Mo'unga comes onto the bench. Sonny Bill Williams will play his second test of the season, and his first since June, at inside center after recovering from a shoulder injury. Coach Steve Hansen has made six changes to the team beaten by the Springboks. Waisake Naholo returns on the right wing, allowing Ben Smith to revert to his specialist role at fullback in place of Jordie Barrett. Williams plays at inside center, forcing Ryan Crotty to outside center as Hansen continues to shun Jack Goodhue, the All Blacks' best player against South Africa. Scrumhalf T.J. Perenara, who also cost New Zealand heavily with poor decision-making in Wellington, has been handed a rare start in place of Aaron Smith. Among the forwards, Ofa Tuungafasi starts at tighthead prop in his 21st test, and in a front row which looks lightweight against a hardened Argentina pack. Sam Whitelock, who combines in the second row with Scott Barrett, will captain the team in the absence of Kieran Read, who is being rested. The absence of Read, and injured flanker Liam Squire, means a shake-up among the loose forwards where Shannon Frizell starts on the blindside and journeyman Luke Whitelock at No. 8. "We've picked what we believe is the best team for this particular test match," Hansen said. "Argentina are a very good side who have shown they can win both away and at home. They're full of confidence and self-belief which will make them a very dangerous beast." Argentina: Emiliano Boffelli, Bautista Delguy, Jeronimo de la Fuente, Bautista Ezcurra, Matias Moroni, Nicolas Sanchez, Gonzalo Bertranou; Javier Ortega Desio; Marcos Kremer; Pablo Matera; Tomas Lavanini; Guido Petti; Ramiro Herrera; Agustin Creevy (captain); Nahuel Tetaz Chaparro. Replacements: Julian Montoya, Juan Pablo Zeiss, Santiago Medrano, Matias Alemanno, Juan Manuel Leguizamon, Tomas Cubelli, Matias Orlando, Sebastian Cancelliere. New Zealand: Ben Smith, Waisake Naholo, Ryan Crotty, Sonny Bill Williams, Rieko Ioane, Beauden Barrett, T.J. Perenara; Luke Whitelock, Sam Cane, Shannon Frizell, Scott Barrett, Sam Whitelock (captain), Ofa Tuungafasi, Codie Taylor, Karl Tu'inukuafe. Replacements: Nathan Harris, Tim Perry, Angus Ta'avao, Patrick Tuipulotu, Ardie Savea, Aaron Smith, Richie Mo'unga, Anton Lienert-Brown.